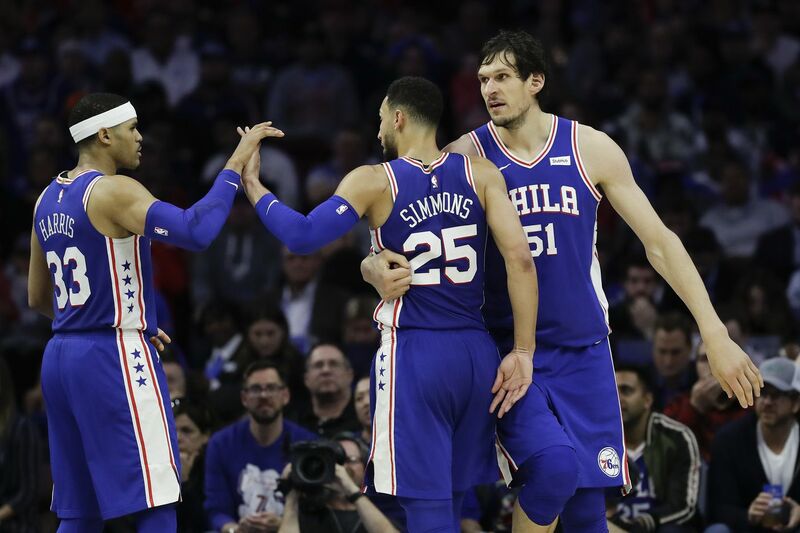 Ben Simmons, who had a triple-double on Monday, celebrates with teammates Tobias Harris and Boban Marjanovic during the fourth quarter of the Sixers' 145-123 win over the Nets in Game 2. Now they don’t have to worry about that. “I thought defensively the way the team came out and responded to some first-half stuff that we needed to fix was a fantastic statement,” Sixers coach Brett Brown said. The Sixers were a much more energized team in Game 2. The big difference for the Sixers from the outset was the aggressiveness of point guard Ben Simmons. And his teammates followed his lead. Simmons caught some serious flak from the fans for his comments about their booing in Game 1. In this game, he didn’t allow the crowd to warm up their booing vocal cords. Unlike the first game, when he would drive near the basket and then kick out, Simmons was going all the way to the hoop for the most part. Limited to nine points in the 111-102 opening loss, Simmons had 16 by halftime and finished with a triple-double, 18 points, 10 rebounds and 12 assists. For the second game in a row, Embiid’s caddy, 7-foot-3 Boban Marjanovic, had a strong game. He scored 14 points in the first half when things were tight, and ended with 16. This time, the Sixers didn’t need the 36 points they received from Jimmy Butler in the first game. He scored just seven, but before Game 2 said he was disappointed he had no assists in the opener. Butler had seven dimes on Monday. Tobias Harris, limited to four points in Game 1, scored 19; and JJ Redick, who had five points in the opener, added 17. Spencer Dinwiddie led the Nets with 19 points. After a 3-for-25 nightmare from three-point range in the opener, the Sixers were 9-for-23 on Monday. Now it is the Nets who have to regroup. The Sixers outscored the Nets in the paint, 62-48, and outrebounded them, 49-32. Late in the first half, things started getting testy. Embiid was assessed a Flagrant 1 foul with 35.6 seconds left in the second quarter. While making a spin move, his elbow caught Brooklyn’s Jarrett Allen in the face. Embiid understood why he was assessed the Flagrant foul. With 2.1 seconds left, the Nets’ Rodions Kurucs was assessed a Flagrant 1 foul for bumping Simmons, who fell to the ground. Simmons made 1 of 2 free throws to give the Sixers their 65-64 lead at intermission. They then won the game with the third-quarter blitz.